36. Blade Runner 2049 | Inhumanwich! 35 years after the release of the original Blade Runner, we finally have a sequel! Join the Cinema Guys as they dive into Blade Runner 2049. What DOES it mean to be human? It’s time for the trailers for the holiday blockbusters to emerge, and The Guys jump headlong into two that promise to be the season’s top blockbusters! Don’t go anywhere because the Cinema Guys have a special at home review of a local Cincinnati movie, Inhumanwich! A special thank you to musical artist, Mike Cobra aka Born with a Broken Heart, for our new music. You can hear the complete track here. Sit back, relax, and enjoy the show as you ponder the burning question…Are you Inhumanwich or a Replicant? 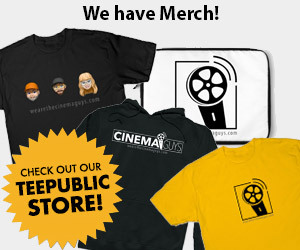 Help the Cinema Guys out and become a Patron of the show. Thanks for listening to The Cinema Guys! ← 35. The Cincinnati Mini Maker Faire Live!